We love a good burrito in my household. I’ve tried lots of different combinations, most of which I have shared on here. Tonight, we did a new combination and here it is! Heat each tortilla for a few seconds on each side in a large skillet over medium-low heat. Remove tortilla, and spoon in some of each of the fillings listed above. Roll the bottom of the tortilla over the fillings, fold in the sides, and continue to roll. 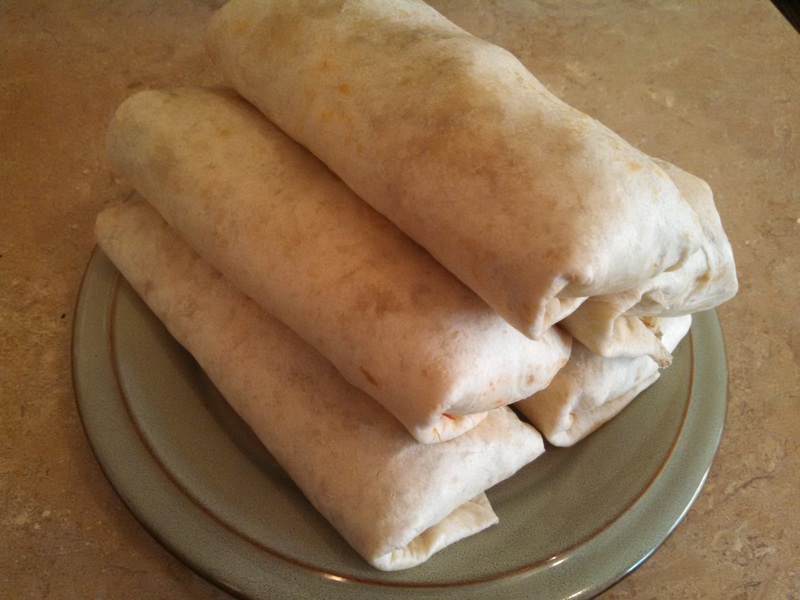 I made 8 burritos, although the last 2 were a little skimpy on the black beans. Since I only used part of a jar of salsa the other night to make our Quesadilla Chicken Sandwiches, I wanted something to use the rest. So, I immediately thought of Sour Cream Salsa Chicken and the burritos I have made with it, but I decided to skip the sour cream. 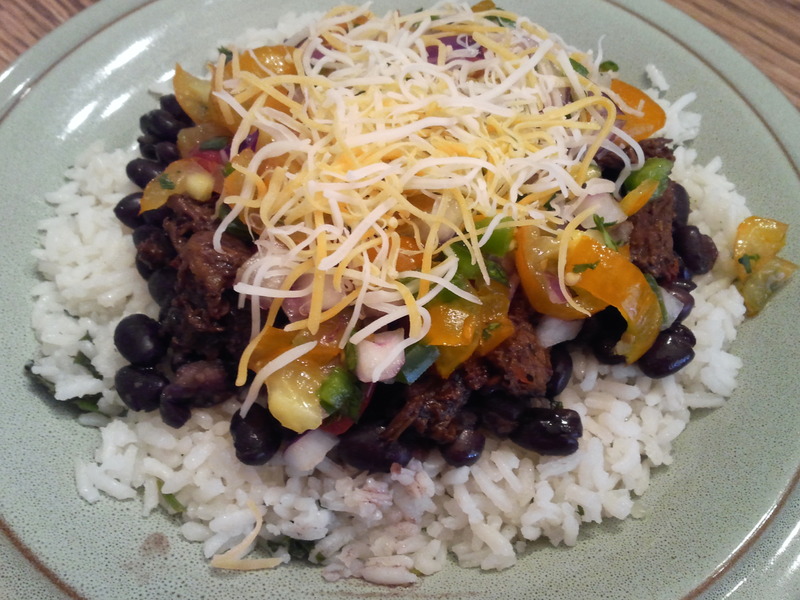 And, instead of Spanish Rice, I thought why not Cilantro Lime Rice and black beans to be like the burritos we get when we eat out at Chipotle? 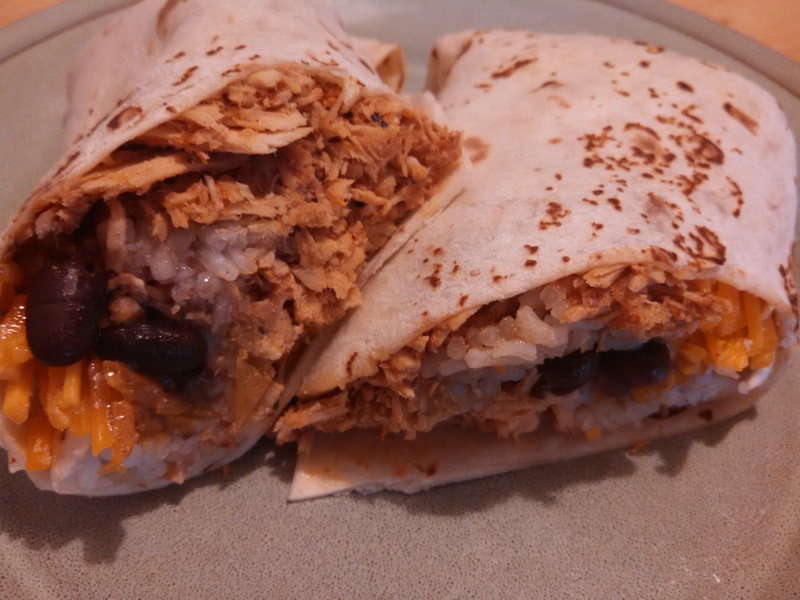 They turned out perfect, and one burrito each was more than enough to fill us up. This made about 8 burritos, with a little rice and chicken leftover. Again, more to tomorrow for lunch! In a small bowl, mix together the chili powder, ground cumin, garlic powder, onion powder, oregano, and salt. Spray slow cooker with cooking spray. Add chicken breasts. Sprinkle chicken with seasoning blend, top with salsa. Cook on low for 6-8 hours, or on high for 3-4 hours. When ready to serve, shred chicken. In a small pot, heat black beans. 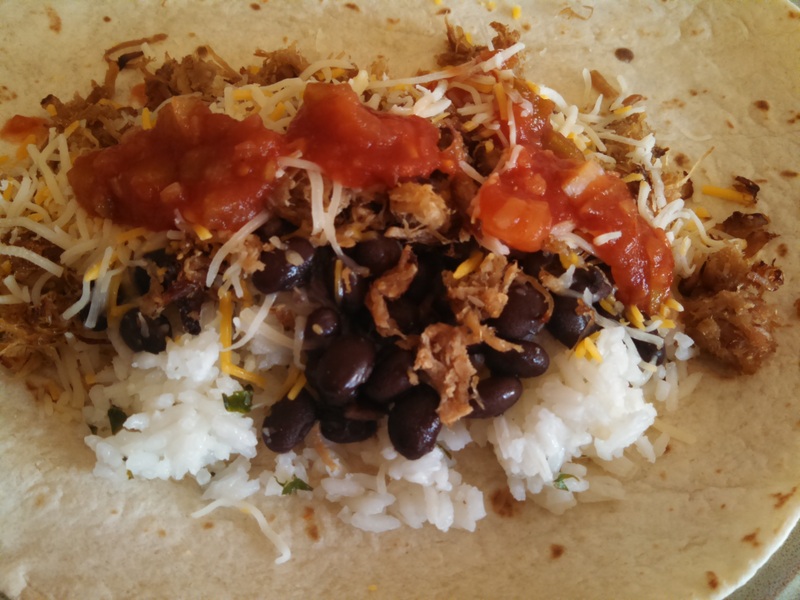 Use a slotted spoon to stir and then drain when making the burritos. Place a large skillet or griddle on stove over low heat. Place a tortilla in the skillet and warm for a few minutes. Remove from heat to counter top or cutting board to assemble burrito. 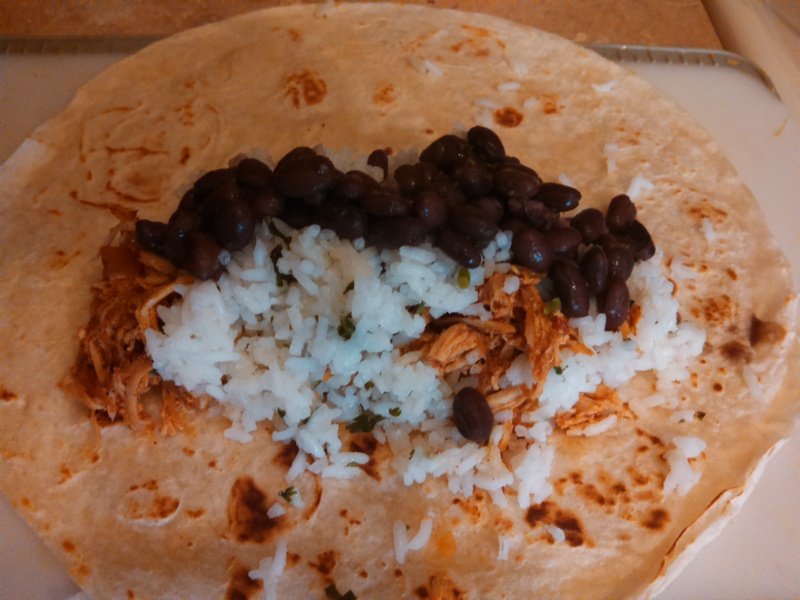 Scoop shredded chicken, rice, black beans and shredded cheese onto the tortilla toward one end. Begin to roll from side closest to you, fold in sides, and roll until completely closed. If desired, cut in half for easier eating. When my daughter asked for Cilantro Lime Rice for dinner, I knew that I wanted chicken to go with it. I just wanted to come up with something a little different. 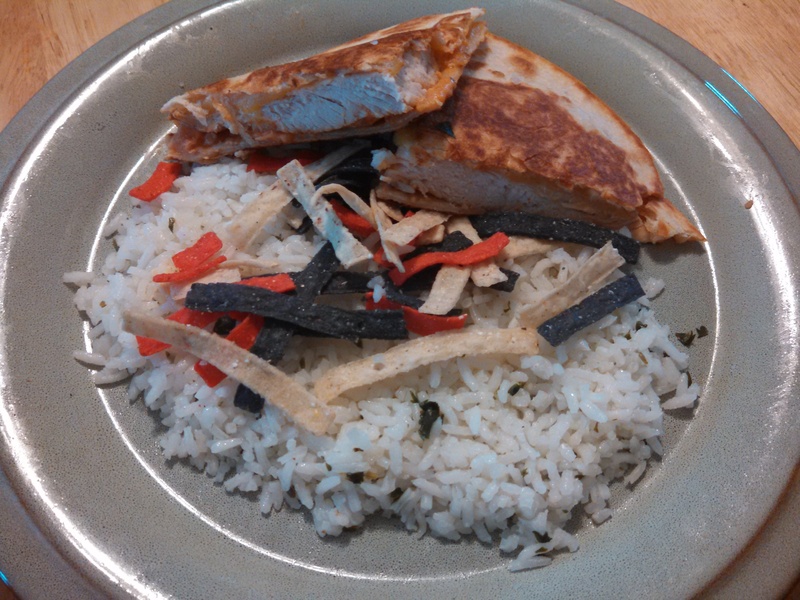 I really wanted Fiesta Lime Chicken, but neither of my kids is a big fan of how it looks. So, inspired by the Quesadilla Burger at Applebee’s, which I love as well, I decided it might be interesting to put the grilled chicken breasts in tortillas, along with the sauce and shredded cheese used in the Fiesta Lime Chicken. It was a big hit, and I’m sure I will make it again! In a small bowl, combine all the marinade ingredients. Place chicken in a gallon size zipper bag or large baking dish and pour the marinade over chicken. Fully coat the chicken in the marinade, seal bag or cover the baking dish, and refrigerate for 2-3 hours or overnight. Remove chicken from marinade, and discard any remaining marinade. Grill chicken until cooked through juices run clear. In a small bowl, mix together the salsa and ranch dressing. Heat a large skillet or griddle over medium heat. Spray with olive oil or butter one side of a tortilla. Place it sprayed/buttered side down on the skillet or griddle. Place shredded cheese on the tortilla, then the grilled chicken breast, then the salsa/ranch sauce, and a little more cheese. Spray with olive oil or butter one side of another tortilla, and place it on top with the sprayed/buttered side up. Cook for a few minutes until the bottom tortilla is browned, then flip to cook the other side. Repeat for the remaining tortillas. Cut the finished sandwiches into fourths (I used a pizza slicer). Each of us ate 2 of the fourths, they were very filling! So, we had plenty of leftovers to enjoy again the next day for lunch. Chipotle has become one of my favorite places to eat at, but I am cheap and can’t eat out a whole lot. I recently found a great way to make Cilantro Lime Rice, but I wanted to see if I could find a way to make my favorite meat, barbacoa, as well. I still had the red chili peppers and chipotle peppers from a Bountiful Baskets fajita pack, and it turns out those were the right start to the barbacoa. I heated up a can of black beans, then made pico de gallo with jalapenos, red onion, yellow cherry tomatoes, cilantro, lime juice, and garlic salt. It turned out so good, it was one of the best meals I’ve had in a long time! 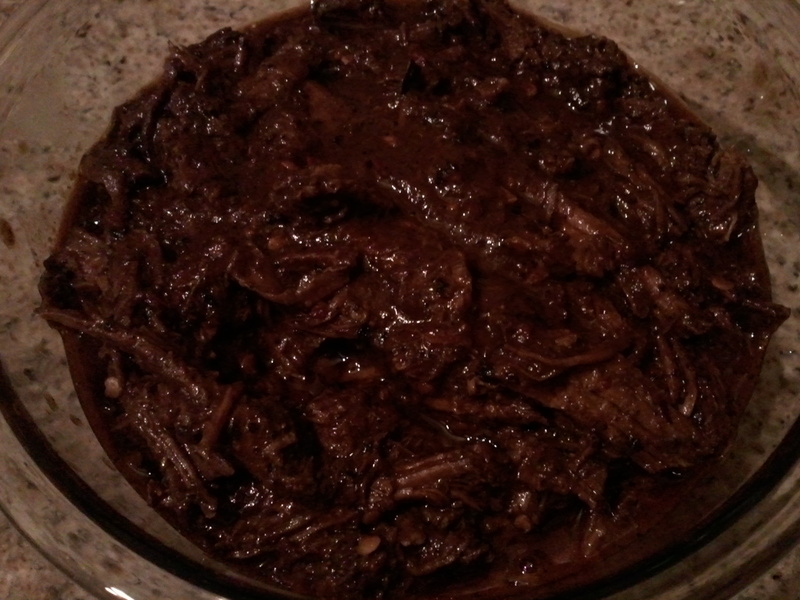 For the barbacoa, I made the sauce the day before and stored in the refrigerator. Then, I bought a chuck roast from a rancher at the Farmer’s Market (Sky Island Brand/47 Ranch). Yes, a little more expensive, but it is grass-fed beef, and much fresher and higher quality than what I can get at the grocery store. Here is how to make it! Place the red chiles in a small sauce pan and heat over high heat, turning frequently, until chiles are toasted and fragrant. Add the chipotle peppers and 2 cups of the chicken broth. Bring to a boil, then reduce heat to a simmer for about 15 minutes, until chiles are tender. Set aside. Meanwhile, in a large skillet heat the olive oil. Add minced garlic and diced onions, cooking them until they are very brown. Add cumin, cloves, oregano, salt and pepper, stirring constantly. 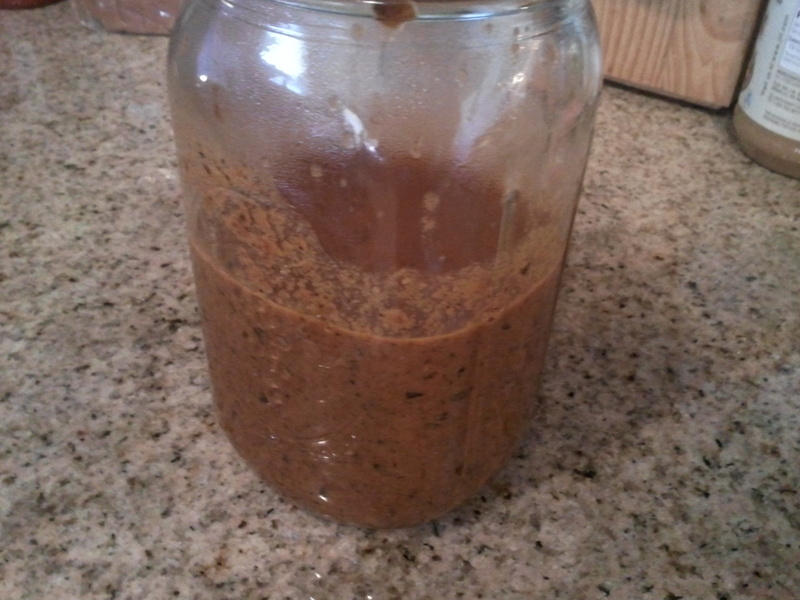 Add in the remaining chicken broth, apple cider vinegar, and the soaked chiles and their liquid. Simmer until reduced by about half. Pour the contents into a blender. Start blending on a low speed, working up to high until well blended. Set aside. Place the skillet back on heat and sear each side of the chuck roast. Place chuck roast in a slow cooker and pour sauce over roast. Add lime juice and bay leaves. Cook on low for 8-10 hours, or until meat is very tender. Once meat is cooked, remove the bay leaves. Remove any bones, and use 2 forks to shred apart the meat. Stir the shredded meat into the remaining sauce. Serve warm as desired. Ideas include in tacos or burritos, over rice or tortilla chips, with salsa, cheese, sour cream, and/or guacamole.